What? You don’t use the 5-Second Rule in your house? Huh. Oh, you don’t know what it is? It is when you’re in the kitchen, or at the table, and a piece of food falls on the floor. You--or someone yells, 5-Second Rule! and picks it up. The yelling and quick pick up means it is safe to consume. Whether the learning content is instructor led in a classroom, a presentation, or an e-learning module, I think the 5-Second Rule should apply to how our learners experience the learning, too. (Well, maybe not the yelling, but the rest of it.) Grabbing learners’ attention in their first 5 seconds or less seems like a valid design strategy to me. Why? 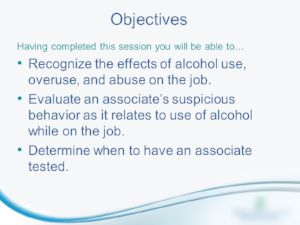 Let’s say the content is the dreaded annual compliance training. How wonderful for the learners to come to the training to find it updated with a fresh approach? That’s a “W” in the win column for everyone. You don’t have to believe me. There is plenty of brain research about attention and focus in learning. Most notably the work of Daniel Goleman. But he isn’t the only one. A quick Google search revealed several scholarly articles, white papers, and such. I found this is a great read in Edutopia, by Donna Wilson and Marcus Conyers. The article explains that attention occurs through the activation of more than one of the neural networks in our brains. The more neural networks active, the more attention the learning content receives. In addition to grabbing the learners’ attention quickly and holding as much of it as we can through, we’re also concerned with their retention of learning. The relationship between attention and retention should be kind of obvious. Where? Inspiration for applying the 5-Second Rule of learning design is everywhere! Visually oriented magazine page layouts and covers, whether online or in print (Vanity Fair, Vogue, Sky Magazine, Living Simple, Washington Post, New York Times, Vox, Brit + Co, Buzzfeed, Greatist, Living – so many! First, the “fashion don’ts”. Whether you’re designing for classroom training (ILT/Instructor Led Training), presentations, or e-learning, none of these are acceptable not apply the 5-Second Rule design strategy. We need to do better. I inherited these two sets of slides several years ago. In each case, the rest of the content was ordered the same way. 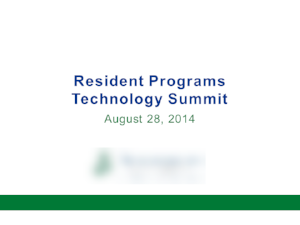 Of course, I mocked this up for use in this post, but you get the idea. Have you sat through one like this in your life? More than one? C’mon! A few examples with the ability to draw the eye, then the brain and attention. Remember, it is important to engage those neural networks! These examples work for several reasons, but the more obvious ones are the skillful use color, the words used, font selection, and placement of the text, too. This one works due to the use of a big picture that applies to the title. Application of color and use of high contrast. 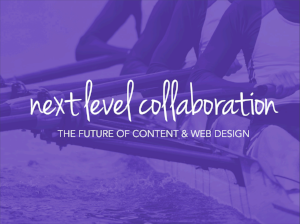 Isn’t it more interesting that the content that grabs your attention first is, “next level collaboration”, instead of “The Future of Content and Web Design”? Words used in the text. 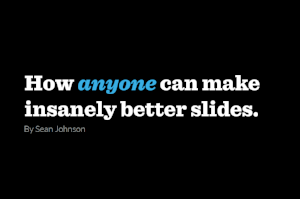 Suggests, even I can make "insanely better slides"
The 5-Second Rule In Action – Let’s Start A Revolution! Sure, sure. You’re busy and have too much on your proverbial plate. BUT, it’s time to do this differently. If not now, when? What really good excuses do you have to not at least try to apply the 5-Second Rule to your next set of learning content?